This abstract was presented today at the Association for Research in Vision and Opthalmology (ARVO) meetings in Seattle, Washington by ME Hartnett, M Morrison, G Page, M Cotten, J Murray, M DeAngelis. 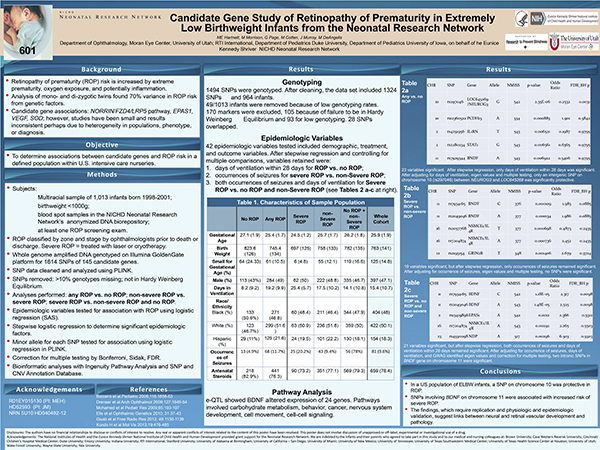 Purpose: To determine associations between candidate genes and risk of retinopathy of prematurity (ROP). Methods: All work was approved by Human Subjects Committees and adhered to the Declaration of Helsinki. A multiracial population of 1,013 preterm infants born less than 1500 grams between 1998 and 2001 had blood spot samples taken as part of a previous Neonatal Research Network study and were included in an anonymized DNA biorepository. ROP was classified by zone and stage in at least one examination until death or discharge. Whole genome amplified DNA genotyping was performed using the Illumina GoldenGate platform for 1614 single nucleotide polymorphisms of 145 candidate genes chosen for relevance within angiogenic and inflammatory pathways. Analyses were performed for associations in genetic variants between any ROP and no ROP, and between severe ROP requiring laser treatment and ROP not requiring laser. Results were adjusted with multivariate analyses to control for gestational age (GA), small for GA, antenatal steroid use, race represented from eigen vector values generated from the sample population, and gender as covariables. P-values < 0.01 were considered significant. Results: 871 infants had at least one eye exam. Of these, 814 were successfully genotyped for 1278 of the targeted SNPs. There were 601 infants with any ROP, and 128 infants with severe ROP. When comparing ROP vs. no ROP, there were 3 SNPs with p-values <0.005 from LRP5. There were also SNPs with p values <0.01 from BDNF, EPAS1, WDR43, and ABCA4. However, false discovery rates (FDRs) were 0.94 for all SNPs in this analysis. When comparing severe ROP requiring treatment vs. ROP not requiring treatment, the SNPs with p values <0.01 included 3 from BDNF, 4 from IGF-1, and 5 from the CFH pathway. For BDNF, FDRs were 0.095, whereas for the other SNPs, FDRs were > 0.37. Conclusions: High FDRs limit certainty of associations with ROP compared to control. However, results support novel associations between BDNF SNPs and severe ROP. In addition, links between severe ROP and familial exudative vitreoretinopathy and macular degeneration should be replicated and validated. A full size pdf of the poster can be downloaded here.